To make better informed business decisions, better serve clients, and increase operational efficiencies, you must be aware of changes to key data as they occur. In addition, you must enable the immediate delivery of this information to the people and processes that need to act upon it. This ability to sense and respond to data changes is fundamental to dynamic warehousing, master data management, and many other key initiatives. A major challenge in providing this type of environment is determining how to tie all the independent systems together and process the immense data flow requirements. IBM® InfoSphere® Change Data Capture (InfoSphere CDC) can respond to that challenge, providing programming-free data integration, and eliminating redundant data transfer, to minimize the impact on production systems. 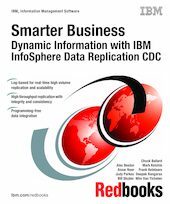 In this IBM Redbooks® publication, we show you examples of how InfoSphere CDC can be used to implement integrated systems, to keep those systems updated immediately as changes occur, and to use your existing infrastructure and scale up as your workload grows. InfoSphere CDC can also enhance your investment in other software, such as IBM DataStage® and IBM QualityStage®, IBM InfoSphere Warehouse, and IBM InfoSphere Master Data Management Server, enabling real-time and event-driven processes. Enable the integration of your critical data and make it immediately available as your business needs it.